The pleasure of a rare opportunity to swim in a fifty metre pool was tempered by the knowledge of what I would be doing in it. In an act of support, I’d reluctantly agreed to perform a Critical Swim Speed (CSS) test – two short time trials to estimate my threshold swim speed. Test sessions are a routine part of most of my training plans, but personally, I despise them. 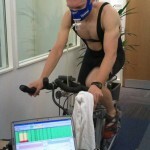 Aside from requiring hard, almost painful exertion they also remove any doubt about performance; without testing I can believe I am getting fitter because I feel I am, but a test gives potentially damning evidence. Midwinter means getting fitter is not the same as being fit, any test will reveal the gap between present condition and race day fitness. I had that sense that swim fitness was improving. Undoubtably it was, I’ve actually been consistently swimming, after a year effectively off anything will increase my fitness. The real question, the one I didn’t want answered, was how much had I lost in the last year? So I jumped into Bath University pool with mixed feelings, pleased to be swimming long course and less than enthusiastic about the sharp reminder of lost form I would receive. Four hundred metres warming up, loosening muscles, priming myself for the test, hoping I might discover some extra purchase on the water and save myself from embarrassment. Lanes were quiet and my ego was massaged by the fact I was the fastest there – at least if I ignored the swim squads to my right – still, it said more about those using the public lanes than my current ability. Rest, then part one – a 400m time trial. It’s a curious sensation as you swim to feel that while you’re pushing yourself, you’re probably not doing a very good job at it. I hit the wall breathing hard, but hard enough? More rest. I pushed more for the second 200m test, but did comfortably surging to pass a slower swimmer mean I still fell short of the intent? Hit the wall, relax, swim down. Job done. Times logged in my Finis Swimsense for later analysis. Much as I dislike testing myself and find the process hard I can’t deny the value. Without benchmarking we’re left with a vague sense of improvement, and it’s easy to mislead ourselves as to how our fitness is changing. Without testing, there is always the potential to be working too easily or perhaps too hard. Everyone hates the tests, a fear of failure and the suspicion you could have achieved more is commonplace. I don’t think the concerns are entirely misplaced, and a race, where it’s an option, is better at eliciting results – a good dose of adrenaline goes a long way to delivering performance. In winter we’re stuck, struggling alone, one eye on the clock as we produce numbers with the potential to disappoint in light of season goals. It can be demotivating, but the numbers are what they are. The only acceptable response is to train well. Before I ran my times through a CSS calculator I already had an idea of the result – threshold was certainly the wrong side of 1:30 and by quite a margin. I knew when I had last been swimming those times and how much I had progressed since. I’ve never been a fast swimmer, but I’d made steps towards it through improved technique and high mileage; my peak swim performances following periods consistently swimming six or seven days a week. I’m currently nowhere near and not sure how close I could come while balancing the desire to rebuild my run and not completely lose my bike fitness. A poor, but expected result could have been demotivating, instead I’m looking at how I can better manage my swim time. I want to recapture some of my previous form. It’s early days, fitness is a long way from where I want it to be, but it feels like it’s improving and that’s exactly the time to test. It is a necessary evil. Swim down, I need new batteries back in my Powertap and a 10K run to complete the set.